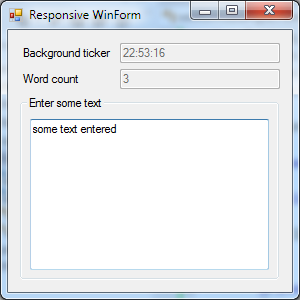 For WPF programming there is a Reactive Extensions extension called ReactiveUI. I like the idea very much, but the last time I have looked at the online documentation, it was slightly out of sync with the current version, and the examples are slightly more elaborate than hello world. I’ll have to return to ReactiveUI at a later point in time. 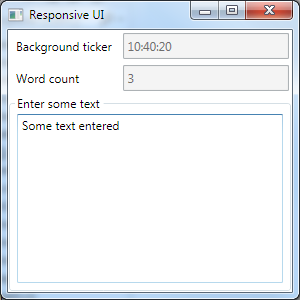 The first TextBox gets updated asynchronously with the current time, the second TextBox shows the word count of the text entered in the third TextBox. All that is defined in a single Load event handler, private void Form1_Load(…). You can get the code here. No threading code needed :). That’s it. No other explicit event handlers, just these observables with lambdas. Update: Since the original post, a lot has changed. ReactiveUI has a shiny new docs site, a lot of API improvements, and improved exposure. This entry was posted in c#, DLed, Programming and tagged csharp, reacive extensions, responsive, rx, ui, Windows Forms, WinForms on February 16, 2013 by DLed.